Put an end to your kitty's chewing -- now. Dogs aren't the only pets that enjoy chewing. If you notice your cat chewing on everything from the drapes in your living room to all of this week's coupon clippings, don't get upset at her. Instead, try to figure out the root of her frustrating and potentially compulsive new habit. Unlike their canine counterparts, chewing is not very prevalent in cats. However, the behavior does occasionally happen. Some felines enjoy chewing on things as a way to soothe themselves, and some may like doing so out of mere playfulness and curiosity. Other possible causes behind a chewing cat include anxiety, boredom and even hunger. Although chewing is more common in younger cats and kittens, occasionally adults do it, too. When cats chew, they tend to gravitate towards soft and smooth materials -- think wool, blankets, sweatshirts and towels. The Cornell University College of Veterinary Medicine states that certain breeds -- such as Siamese and Burmese -- are especially fond of chewing on wool. This suggests a positive hereditary link to compulsive chewing patterns. The chewing doesn't always stop with soft and comfy fabrics, though. Some cats also take it to a more dangerous level, resting their chompers on cords, wires, toxic plants and even plastic bags from the grocery store. Essentially, some cats will indeed chew on anything at all. Chewing behavior is pesky all around, and can totally ruin everything from your favorite work pumps to the surface of your brand new sectional sofa. However, it can also pose a serious health threat to your little one. For example, if your precious pet ingests too much wool, it could block her digestive tract and be deadly. If she accidentally sinks her teeth into begonias or azaleas in your backyard garden, poisoning could occur, as both plants are toxic to felines. Chewing on cords and wires can also trigger electrocution -- yikes. Because of the scary danger factor, always take your fluffball's chewing behaviors seriously. Never under any circumstances allow her any contact with toxic plants. Also, to prevent your cat from experiencing shock due to chewing on cords and wires, always conceal them with tubing. If your cat's chewing is causing you to live your life in nonstop fear, stop now. You can take action to prevent your kitty's problem. Focus changes can be effective. Try giving her new things to chew on, for instance. Go for a kitty chew toy or carrot sticks. If that doesn't work, try renewing your cat's interest in stimulating, interactive toys, as boredom is a major culprit in feline chewing misbehavior. If your little one is sick of her laser pointer, feed her yummy treats in between "chasing" sessions. Once your cat associates the pointer with tasty food, it may reactivate her enthusiasm in it. 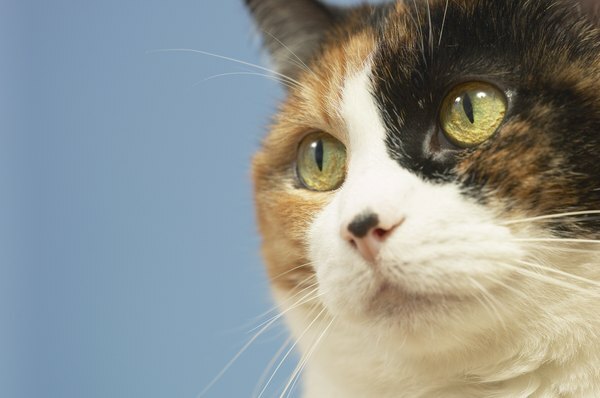 Get creative in keeping your cat off of her pesky and harmful chewing issue. To be on the safe side, schedule an appointment with the vet to make sure your kitty's chewing is not related to any medical ailments, such as parasites. If you're worried your pet's compulsive behavior won't end any time soon, also ask about the possibility of temporary anxiety-easing medications to manage your feline's compulsive patterns. What Happens if a Cat Swallows a Piece of Chewing Gum?